Transparent Chair Is Probably Easy To Clean | OhGizmo! Shrink wrap might be the bane of anyone eagerly trying to open a new purchase, but it turns out it’s also a handy material for making furniture! This Transparent Chair from Japanese design firm Nendo is made from three metal loops wrapped in polyurethane film that ends up supporting someone kind of a like a hammock. It certainly looks pretty comfortable, and creates the clever illusion of someone just floating in the air, but on the flipside given the film doesn’t breathe, it’s probably a real sweat factory on a hot Summer day. Thankfully though cleaning is probably as easy as just re-wrapping the frame in a fresh layer. looks really cool, unusual and comfortable… but what is it is broken? i mean if it wont handle someones weight? Don't keep your keys in your back pocket. And if you have a boney bum, you might want to reconsider this as well. I wonder what the effect flatulence might have? A high-pitched wine, encapsulated bubble or a quick ejection? I actually designed a chair about 8 years ago that was almost identical to this. Although we used a white translucent material and had a light in it. I should have actually tried to get it made instead of just using it for a good grade. It gives a feeling of uneasiness – how can you …trust an invisible chair? 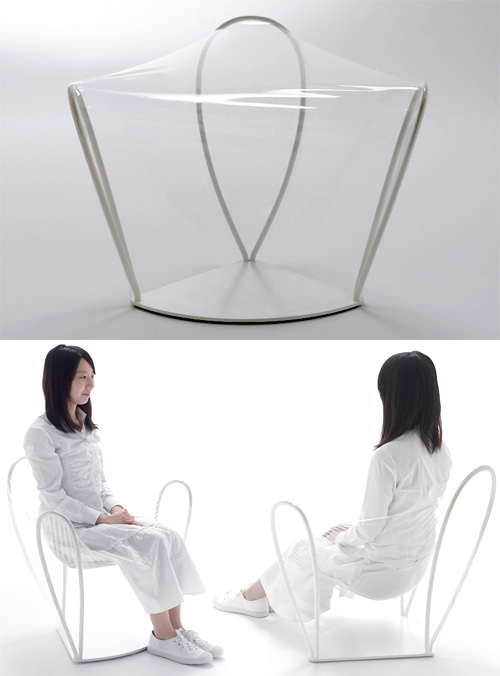 An original idea though, and an innovative use of polyurethane film – this chair has a dreamlike, “sitting-floating” quality!